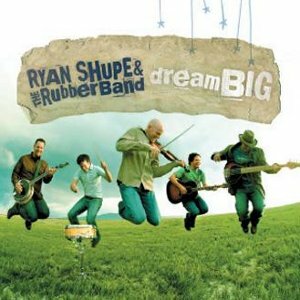 Ryan Shupe and the Rubberband is a five-man band from Salt Lake City, Utah. They are members of The Church of Jesus Christ of Latter-day Saints, sometimes casually called the Mormon or LDS Church. The group is energetic and presents a program that's diverse and ebullient. Ryan is a fifth-generation violinist who has been playing since he could walk. He played with a group of children assembled by his father, called the Pee Wee Pickers. He played with bands throughout high school and college. He began forming bands, but hated it when musicians dropped out. He formed the RubberBand with the idea of drawing from a pool of musicians who could wander in and out. However, certain members seemed to stick, and the band soon became a cohesive unit. Most of the members had known each other from the area circuit before they joined Shupe in the RubberBand. Banjoist Craig Miner first started playing music on a ukelele he bought at a garage sale, and from there added banjo, guitar, mandolin, and bouzouki. Performing with groups like Fire On The Mountain and Salt Licks, he had known Ryan for years before joining the RubberBand. Drummer Bart Olson grew up playing with his family’s band, the Olson Family Fiddlers, and at 12 picked up the drums. Focusing on jazz percussion, his interests soon broadened to include country, rock, funk, latin, ska, and blues and he played in various bands and with blues player Matt Harding before joining Ryan. Guitarist Roger Archibald has been playing guitar since he was 11, and actually played in a band that Ryan’s dad organized, String Fever, when he was growing up. (Ryan’s brother and sister also played in that band.) He worked as a regional musician in the same circles as Ryan for years before joining the band. Ryan Tilby also played in String Fever with Archibald before joining the RubberBand for the first time on banjo. After leaving the band, he attended Utah State University, where he studied jazz guitar. He obviously could not stay away for too long though, as he returned to the band in 2006 as the bassist (MormonMusic.org). "After decades of unspoken tension between Ryan Shupe & the RubberBand and the nationally acclaimed and award-winning a capella group T Minus 5, the gauntlet has finally been thrown down. On stage, both bands have proven to be masters of their genres, winning fans and sharing stages - but behind the scenes, they have been drawing invisible lines in the sand for years. You see, musicality aside, each group claims to hold the title for Musical Artist Ultimate Frisbee Champions of the West (MAUFCOW). MAUFCOW, as you well know, is the Ultimate Frisebee duel of doom that dates back to the early seventies, when the Osmond Brothers trounced the BYU Men's Chorus is a 17-0 shutout. And now the rivalry lives on. T Minus 5 has vowed to crush the RubberBand, and has even claimed repsonisibility for a late-night toilet-papering of the RubberBand van. The RubberBand has answered with this challenge: that the two bands meet in a public place during daylight hours to settle this matter once and for all - with a frisbee. The clock is ticking" (the band's official website). This page was last edited on 12 September 2011, at 18:27.